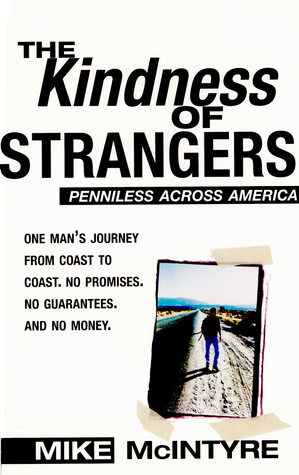 One journalist gets a crazy idea and decides to hitchhike across the United States without a cent. This is basically what this book is about. We meet Mike in California. He has traveled the world and decides he wants to do something more realistic, I guess. He gets the bright idea to hitchhike across the United States without any money. This was in 1994, not yesterday, so nobody get any ideas. This is not a safe mode of travel, ok? Anyways, Mike takes himself and his pack along for the ride across the United States. His ultimate goal is Cape Fear, NC. His journey will stretch ocean to ocean. Personally, I am not going to pick up a hitchhiker. I’m also not going to hitchhike. I have had to walk many places on foot and I did get a few rides. When I was in college I lived a short walk from where I worked and where I went to school for a while, and some people I knew would stop and pick me up. I knew those people though, they weren’t strangers, ok? I used to get rides from all kinds of people going down the hill to the nursing home. Fellow nurses aides, families of the patients, and even the kitchen staff would give me lifts down the hill, not that it mattered very much, since by the time I got to the top of the hill, I was almost at work anyways. Mike was brave to do this, but it also could have been a very foolish decision. He relied simply on other people’s’ generosity to get him through his journey. Surprisingly, it only took six weeks. I would have thought his journey would have taken him much longer, but he found enough good people, to pare a trip across the entire United States down to six weeks. People do try to give him money from time to time, but mostly they give him rides and buy him food. Some people let Mike sleep in their homes and some people tell him to sleep in the backyard. There aren’t too many nights that Mike has to fend for himself in his sleeping arrangements. Mike makes a note that generally, people who help him out are poor themselves. There are a couple of more affluent people who help Mike, but for the most part, it’s the people on the poverty line, or pretty close, that help Mike out. That is kind of sad. You would figure that the more money a person had, the easier it would be to help a person out. It’s not always true though. I have met many poor people who will bend over backwards to help a friend or even a stranger, but I have met many other people who live comfortably in their means, who won’t lift a finger to help others. It’s backwards, but that is the way it generally works. These days a person just can’t go hitchhike across the United States. It’s dangerous. First of all, someone just might run over you. I’m serious. If there isn’t a sidewalk, I am generally not going to walk there because people just don’t pay attention while they are driving. Second of all, someone might murder you. There are plenty of murderers who do what they do and never get caught. That is kind of scary, but it’s life. Third of all, human trafficking is still alive and well in the United States. Yeah, what Mike did was stupid, but you have to admire the guy for having the guts to do it even though none of us would ever do this ourselves. Another thing that is rather disturbing to me about Mike’s journey is that he encounters so many people who are racist. This was over ten years ago, so people have had some time to lighten up and quit being jerks, but I was still surprised that, even in 1994, he encountered so much racism. It boggles my mind that people still choose to behave like that. We follow Mike on his journey which seemingly exposes areas of the country where people are jerks. Ok, they’re not entirely jerks. Most people with any sense don’t pick up hitchhikers. The person on the side of the road could be Santa Claus, but it’s not wise to pick him up, because he could also be the Santa Claus Strangler. What I liked: I do like the acts of kindness Mike was able to find across the country. Some acts were from declared Christians, while other acts were just from kind people. It is really refreshing to read about someone, in real-life, who takes their time to help somebody else. Most of the time, we hear about people who take their time to hurt other people. What I didn’t like: I almost want to reach through the internet and shake Mike and ask him what he was thinking. I mean, he was a grown man and all when he started his journey, and honestly, I probably wouldn’t have cared in 1994. There is just something about a person who willingly puts themselves in harm’s way. For example, in South Carolina, it’s not a law to wear a helmet on a motorcycle, moped, scooter, or bicycle. I know right?! That is crazy! I grew up in an area that required helmets. Wear your helmet people! Seriously, it’s only going to help you. Every time a person on a motorcycle goes by without a helmet, I want to roll down my car window and shout at them for being stupid. MIke put himself in this situation and the reader and everyone else could have said, “I told you so,” had something happened to him. Luckily, it seemed like someone was watching out for Mike on his journey. He didn’t get stabbed, shot, mugged, or raped. There were a few near misses, but Mike stayed mostly intact. I know I mentioned this before, but it’s still kind of offensive. Mike encountered a ton of racist people, who weren’t afraid to state that they hated anyone who wasn’t white. What makes you that kind of person? I can’t put two and two together on this one. It’s weird, it’s odd, and it’s un-American. Our country is “supposed” to be a country where everyone is valued for themselves and not for their color or ethnic heritage. Overall, I found Mike’s journey a very entertaining read. It was on Kindle for free, so if it still is, go ahead and snag it up. In my experience, I think it is a good idea to be clean-shaven when you are hitchhiking. I have met a lot of great, helpful people on the road. And when I needed to make a few bucks, I would always find some work for a day or two–or maybe I should say, work came to me.